Trinity Catholic Academy is committed to providing affordable Catholic education to families who want to participate in our program. We endeavor to keep our tuition low through various fundraisers and we receive generous support from St. Patrick and St. Hyacinth parishes. See below for pricing and tuition assistance programs. Application forms and materials are available on the TCA Office and News page. Tuition can be paid annually in one sum at the first day of school or by monthly bank draft through the FACTS Tuition Program. In addition to the tuition plan, there is a $225 book fee for each student and a $150 technology fee per family. Please note that preschool needs to be priced separately. It cannot be included in a multiple child discount. Prices below are for 3 or 4 year old children. A hot lunch program is available to all day students. Aftercare is available until 5:30pm ($8 / 1 student, $12 / 2 students). Visit our preschool page here. $125.00 per week with $150.00 annual supply fee. Includes lunch and aftercare until 5:30pm, if desired. This program is eligible for the State of Illinois Kid Care Connection program for qualifying families. Tuition assistance and diocesan scholarships are available to help reduce tuition cost for qualifying families. Applying families should be active and registered in a Catholic parish. Assistance is provided according to need as is demonstrated by a FACTS report. FACTS is a third-party, confidential, grant and aid assessment company that assists TCA and the Diocese of Peoria in fairly distributing available funds. Families seeking assistance should apply for the John Lancaster Spalding Scholarship Fund by February before the upcoming school year. Grants are for one year only. Families are reminded that to renew grants, they must reapply each year. Our students learn best when they are in a secure and caring environment. We aim to preserve a school culture that is Christ-centered and family focused. Faith Formation - Students pray daily, attend Holy Mass weekly, and participate in regular Adoration and Confession. Most liturgies are student-led and student-planned. Faith, Morals, and Sacred Scripture are studied daily as a classroom discipline. The priests are active in visiting and teaching at the school and altar serving training is available for those in sixth grade and above. Extra Curricular - Many additional opportunities are available to our students including scouts, speech team, scholastic bowl, choir, and student government. Community Service - As part of our commitment to Christian service we strive to serve those in need. Each class takes turns making hospital tray favors for the sick at St Margaret's hospital. The students serve the poor through the Giving Tree and supporting the local food pantry. Our students also raise money for charities such as Horizon House, the Heart Association, and Relay for Life. Seventh and Eighth grade volunteer as a class to help at the nearby Lighted Way facility. Safe Environment - All our teachers and volunteers must complete the Diocesan Safe Environment Program and pass the Child Abuse and Neglect Tracking System. Our teachers and volunteers have complete background checks with fingerprinting. There is an established and enforced pick-up and drop-off procedure and the school is secure during the day, visitors need to be buzzed in before being able to enter the building. After School Care - After school care is available for all our students preschool -eighth grade until 5:30pm in dedicated space in the building adjacent to Holy Rosary Shrine. PTSA - Our Parent-Teacher-Student Association actively promotes the school, participates in fundraising, and establishes a family atmosphere within our community. Our parents and families are also involved as coaches, chaperones, classroom helpers, lunchroom helpers, scout leaders, and room parents. Dad’s Club - Our TCA Dads group meet from time to time for a steak and camaraderie and also to take care of tasks around our school. Hot Lunch Program - The TCA Cafeteria provides a daily lunch for only $2.50 per student. The lunches are nutritious, served with fresh fruits and vegetables and milk. Our school curriculum seeks to achieve not only excellence in education, but also excellence in life. The courses we offer present academic studies with this wider sense of purpose. Low Student /Teacher Ratio - Our average class size is twenty students allowing each student the individualized attention they deserve. Smaller class size requires all students to work together and reduces isolation and cliques. 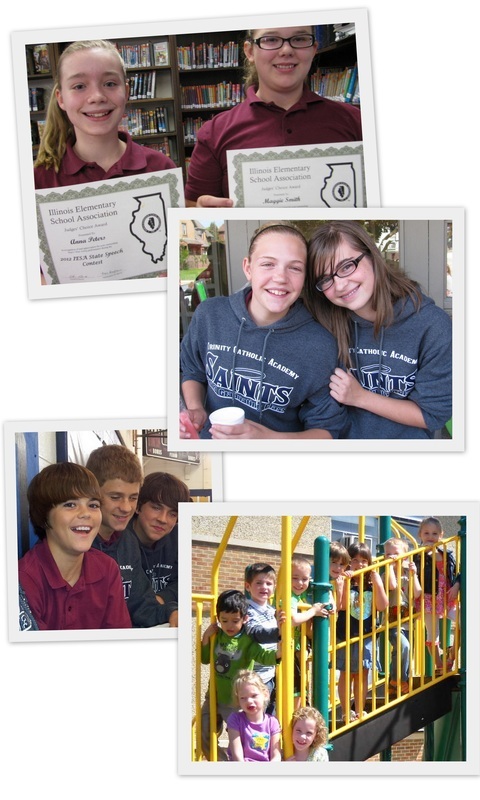 Proven Academic Program - TCA fulfills the Illinois State Learning Standards, is accredited by the North Central Association, and is an AdvacED Member School. All teachers are qualified and licensed and participate in regular professional development opportunities. Curriculum-based measurements (easyCBM) are taken three times per year to monitor student growth and guide individual student improvement. The Iowas Test of Basic Skills shows TCA students continually score above grade level each and every year. Click here to see all the score results. Strategic Plan - Click here to read the strategic plan for TCA to do even more and be even a greater blessing to its students and the local community in the years ahead. Integrated Technology - The online grade book (TeacherEase) is always accessible for first through eighth grades. Technology instruction is offered regularly and technology is utilized in the other disciplines such as math, science, and social studies. In 2014 TCA adopted a comprehensive five-year technology plan that, among other things, leads to a 1:1 Chromebook program for the Junior High. The school uses Google Apps for Education, a complete office suite that allows our students to work from any device whether at school or home as well as allow teachers and parents to review student work real-time. Competitive Athletic Program - Sports and healthy competition are an important part of our students' development. We offer a full athletic program, often cooperating with other local Catholic schools. Volleyball, basketball, track, cheer, and baseball are available. See our athletics page for more information. Arts - Our students express themselves and their faith through our art and music programs. Tutoring Program - A no-cost tutoring program is available to students who need extra help after school. Our classroom teachers will make arrangements to provide personal help with any student who needs it on a regular basis. ​​Taryn Watkins will present her experiences on the Via Francigena, her pilgrimage walking from Canterbury, England to Rome, on Wednesday, November 30, at 7:30 p.m. in the side chapel of St. Patrick Church. All are welcome to attend! No adoration at St. Hyacinth on Tuesday, Wednesday, or Thursday, Nov. 22-24th. The Six Churches and Chapels that are Holy Door Sites in the Diocese of Peoria. Holy Rosary is among the Churches and chapels chosen as a place of pilgrimage for the extraordinary Jubilee Year of Mercy. See the Catholic Post article on the pilgrimage sites here. Read Bishop Jenky's Festival Letter here. Schedule an appointment now to be included in the LaSalle Catholic Parishes Photo Directory, before time runs out! All participants receive a FREE family directory and a FREE 8x10 portrait. Photo appointments will be held Nov 14-16, in the Mother's Chapel (side chapel) of St. Patrick Church. Please enter thru the west-side, handicap entrance of St. Patrick Church. Sign up online HERE or by calling the parish office. By appointment only. The Catholic bishops of the United States are pleased to offer once again to the Catholic faithful Forming Consciences for Faithful Citizenship, a teaching document on the political responsibility of Catholics. This statement represents their guidance for Catholics in the exercise of their rights and duties as participants in our democracy. Pastors, lay and religious faithful, and all people of good will are urged to use this statement to help form their consciences; to teach those entrusted to their care; to contribute to civil and respectful public dialogue; and to shape political choices in the coming election in light of Catholic teaching. The statement lifts up our dual heritage as both faithful Catholics and American citizens with rights and duties as participants in the civil order. The Utica Knights of Columbus are sponsoring a Turkey Dinner to support our diocesan seminarians in their preparation for the priesthood. Saturday November 5th, 4pm to 7pm at the K of C Hall in Utica (500 E Hitt St Utica). Tickets are $10 for adults and $5 for Children under 10. Carry-outs will be available. To assist the Knights with the number of guests, please send checks payable to Utica Knights of Columbus to Jim Polizzi at 500 Hitt Street, Utica, IL 61373. *Please note the change in the 9:15 am TCA School Mass to Tuesday so that the children can attend Mass on the Holy Day of Obligation. Masses on Wednesday, November 2 will be 7:00 am and 8:00 am. The LaSalle Catholic Parishes will be hosting a concert by Mitch McVicker. Mitch is a GMA Dove Award winning contemporary Christian music singer and songwriter, who came to fame through his close friendship and collaboration with recording artist Rich Mullins. Mitch will be performing a FREE concert at St. Hyacinth Church (927 10th St, LaSalle, IL) on Thursday, October 27th at 7pm. All are invited to attend! Read the NewsTribune article about this concert HERE. Join the rich tradition of our Annual Spaghetti Dinner Fundraiser to benefit Trinity Catholic Academy on Sunday, October 16th from 11:30 AM to 2:30 PM in our school gym. Dinner includes spaghetti, salad, garlic bread, dessert and drink. Adult tickets are $8.00 and tickets for Children (10 and under) are $5.00. 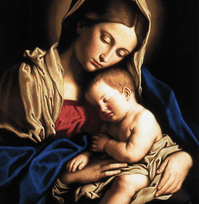 Did you complete consecration to Mary with the Fr. Michael Gaitley's book 33 Days to Morning Glory? Then please join us for Fr. Gaitley's next study, Consoling the Heart of Jesus. This do-it-yourself retreat combines the Spiritual Exercises of St. Ignatius with the teachings of Saints Therese of Lisieux, Faustina Kowalska, and Louis de Montfort. Fr. Michael Gaitley, MIC, has a remarkable gift for inspiring little souls to trust in Jesus, and his Divine Mercy. This study meets weekly on Tuesdays from 6:30-8pm, begin September 27 and ending November 29, 2016, in the Omega Room of the parish offices. Please sign-up with Sue at the parish office by 9/19. Walking Toward Eternity, by Jeff and Emily Cavins, is an inspiring series designed to help participants live their faith more fully. Through daily prayerful meditation with Scripture (lectio divina), they will be drawn into an intimate and life-changing encounter with Christ. Daring to Walk the Walk, the first series of Walking Toward Eternity, introduces seven key virtues and outlines practical steps for living them out in daily life. ​This 8-week study will meet on Monday evenings at 6:30-8pm, from October 3 to November 28, 2016 in the Omega Room of the parish offices. Please sign-up with Sue at the parish office by 9/19. 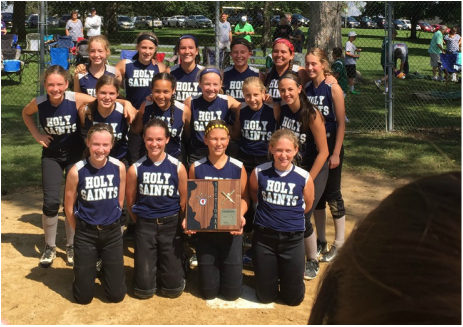 TCA 7/8th Grade Softball: Sectional Champions! ​The Blue Mass is held on the feast of Saint Michael the Archangel to honor police, firefighters, and other emergency and law enforcement personnel and their families. Join us to show gratitude to first responders and honor those who have died in the line of duty. Catechetical Sunday is a wonderful opportunity to reflect on the role that each person plays, by virtue of their Baptism, in handing on the faith and being a witness to the Gospel and to rededicate ourselves to this mission as a community of faith. At the LaSalle Catholic Parishes, we are proud to catechize over 400 children each year in our CCD program and Trinity Catholic Academy. We appreciate the hard work of all of our teachers and staff that make this possible. May God continue to bless them and our students abundantly! Join Father Dittmer on a pilgrimage to the Shrine of Our Lady of Guadalupe and Mexico City! Click on the link above to download the informational brochure and reservation form. ﻿​​Signup for this Pilgrimage will end on September 30, 2016. All those interested in becoming Catholic, learning more about the Catholic faith, or those Catholics who are interested in receiving the Sacrament of Confirmation are invited to participate in The Rite of Christian Initiation of Adults (RCIA). It will begin on Tuesday, September 13, at 6:00 p.m. at the St. Hyacinth Rectory. For more information, contact Fr. Dittmer or call the Parish Office. All are welcome to attend. ​No Admission Fee! ﻿Stacy Konczak directs our school music program and our Junior High Choir - which finished the school year with some great work at First Communion, Confirmation, and the Graduation Mass. Check out some videos of our students singing their favorite pieces on our Music Page. 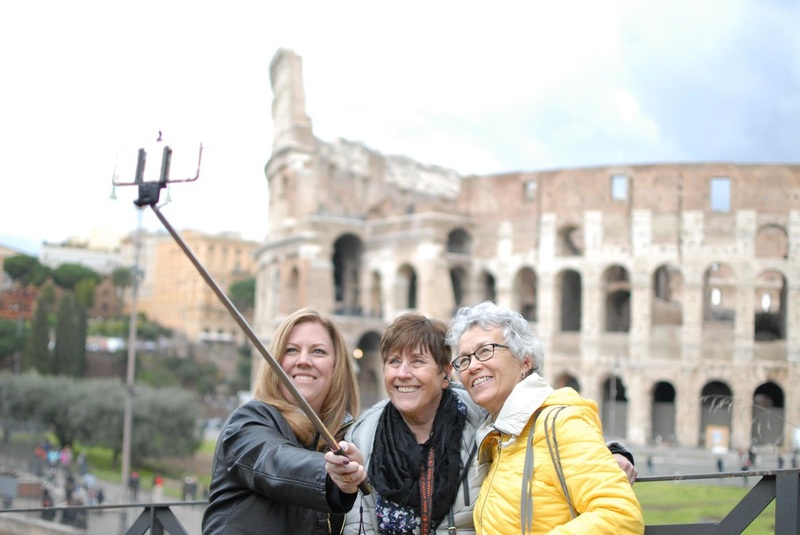 Highlights from our Parish's Rome pilgrimage can be seen in 351 photos! This is the third of our trips to the Eternal City, Assisi, Orvieto, and other holy sites. A full collection of the pictures at original resolution is available in the parish office. Thanks to our volunteer photographers for submitting their pictures of our First Communion Masses. We have nearly 700 pictures uploaded! Please save any you would like because we can't keep this many on our website! Totus Tuus is a fun-filled, week-long Catholic summer program for youth in grades 1-12, running July 24-29th. This program is available for FREE to registered parishioners of the LaSalle Catholic Parishes. For the last two years, the LaSalle Parishes have sent the most participants to Emmaus Days from throughout the whole diocese. Come see why this program is so popular among our young men. Emmaus Days is a vocations awareness program sponsored by the Diocese of Peoria. By providing a spiritual, fun environment for young men, we help make them more aware of God’s presence in their lives and get them excited about living their faith. In a great mixture of spiritual activities and summer fun our participants learn to approach their faith with joy and confidence. More information and videos can be found on the website: comeandfollowme.org. Each year dioceses around the country arrange special events to highlight the importance of defending religious freedom. The Fortnight for Freedom is from June 21—the vigil of the Feasts of St. John Fisher and St. Thomas More—to July 4, Independence Day. To read the USCCB Statement of Religious Liberty, click HERE. To watch a USCCB video on Religious Liberty, click HERE. We are pleased to introduce the new parochial vicar of LaSalle Catholic Parishes. Father Valle was ordained to the priesthood on May 23, 2015, and previously served as parochial vicar at St. Philomena Parish in Peoria. Thank you, Father Carlson, for all you have done for the LaSalle Parishes! 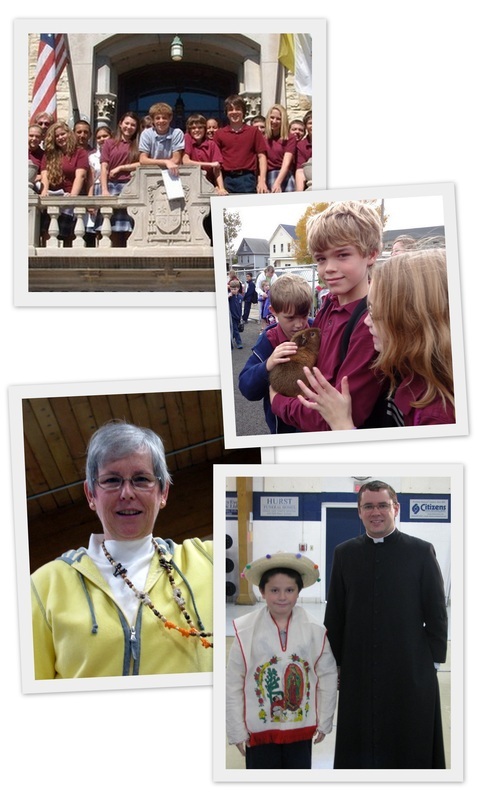 We wish you the best in your new assignment at St. Mary Parish in Utica. 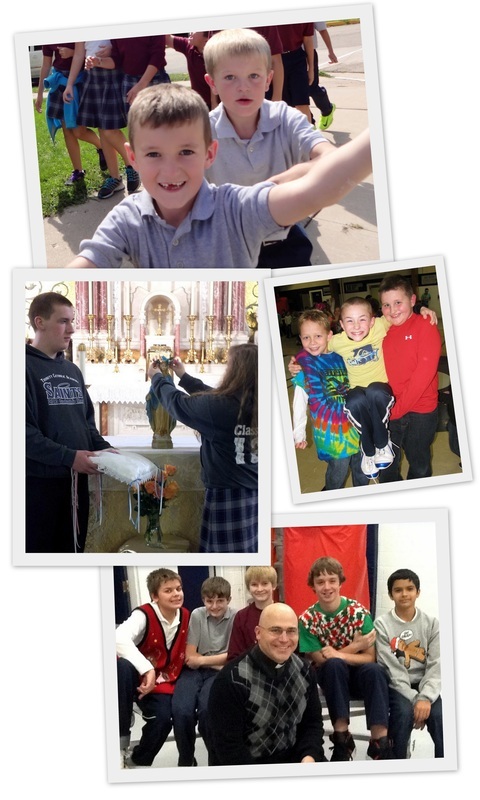 Altar Servers, EMHCs, and Readers - Please find your summer serving schedules on our schedule page. Thank you for your service! TCA Track is Going to State! Happy Easter! And Congratulations to our New Catholics! Sincere congratulations to all those who entered into full communion with the Church this Easter! This new life was celebrated beautifully at Holy Rosary Shrine. Photos here. 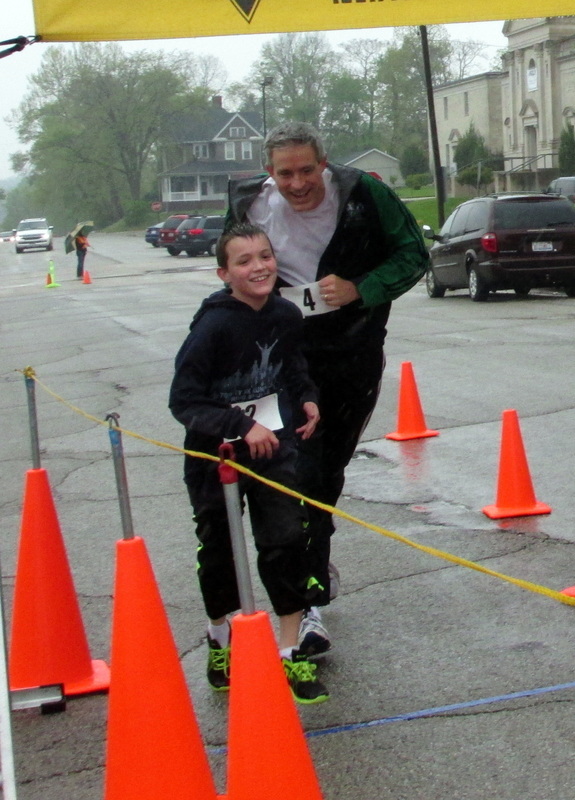 Despite the weather our 5K was very successful, raising thousands for our school after expenses. Congratulations to Dan Kasperski Overall Male Winner with a time of 18:51!! Congratulations, Molly Kasperski, Overall Female Winner with a time of 24:08. 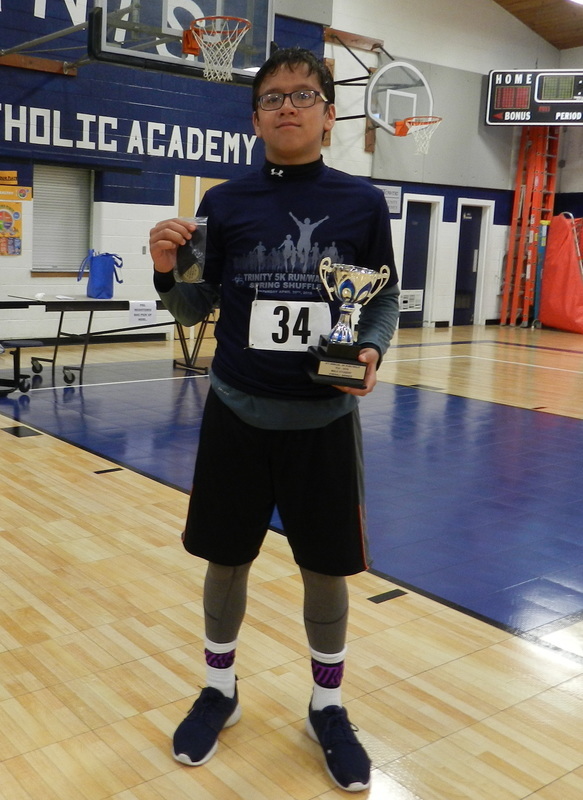 Trinity Catholic Academy Proudly Announces the Overall Male and Female Student winners: James Sanchez with a time of 24:01 and Ella Thompson with a time of 26:45. Complete results of the race can be found here. More photos are on the TCA photo page here. Thank you to our organizers, volunteers and participants! A special thanks to the La Salle Police Department, Starved Rock Runners Club, and D&M Road Race Scoring! Thank You Sponsors: Gold Sponsors: La Salle State Bank, IVCH, Peru Federal, Burgess Funeral Home, Peru Federal, and Hometown National Bank; Silver Sponsors: News Tribune, Inman Electric Motors, Inc., Dr. Matthew Hartman, DMD, and The Urbanski Family; Bronze Sponsors: La Salle Body & Fender, Mark A. Henry, DDS MS, Hueneburg Financial, Maestro & Mi Music Academy, Hurst Funeral Home, Majestic Donuts & Pastries, INc, Grasser’s Plumbing & Heating, Steven J. Ludford, D.D.S, HyVee, Ficek Electric, and Save-A-Lot. Congratulations to our 49 Confirmands who received the fullness of the Holy Spirit April 5th! We are proud of you and look forward to your participation as fully initiated Christians in the Church. Many Thanks also to our Parents, Sponsors, TCA and CCD Teachers for all their efforts in assisting and forming these young people during this time of preparation to receive this important sacrament. Our Choir and Musicians put in many hours of work - and it certainly showed. Bishop Jenky remarked that our choir was the best parish choir he as heard as he goes around the diocese for confirmations. He even invited our choir to sing at the Cathedral! We are especially proud of our TCA Junior High Choir for their amazing work and flawless chanting of the Regina Caeli. Our Altar Servers, who were siblings of those being confirmed, also did a very professional job. Photos are available now. We will have to wait a while for our formal group photo with the photographer, but please find below the link to the photos taken by our parishioner volunteers. There are three sets of photos, so most events are covered three times - when choosing which you might want to save, please scroll through all the photos! UPDATE! Congratulations to Lucy Kleczewski, Adam Sarabia and Ashley Urbanski who all advanced to the State History Fair in Springfield. The History Fair took place on Thursday, May 5th and all 3 students received Superior placement for their projects!! Thank you for representing TCA in such a positive manner!! 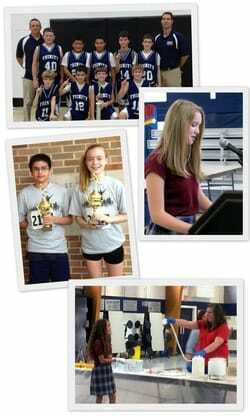 Back in January, all of our 7th graders participated in TCA's 7th Grade History Fair. From that event, 9 of our students scored high enough to participate in the Regional History Fair at Northern Illinois University on February 27. Congratulations to Beau Gerber, Brady Hurst, Lucy Kleczewski, Mia Mazzorona, Caroline Moskalewicz, Lauren Phillips, Adam Sarabia, Garce Stachowiak and Ashley Urbanski for this great accomplishment. 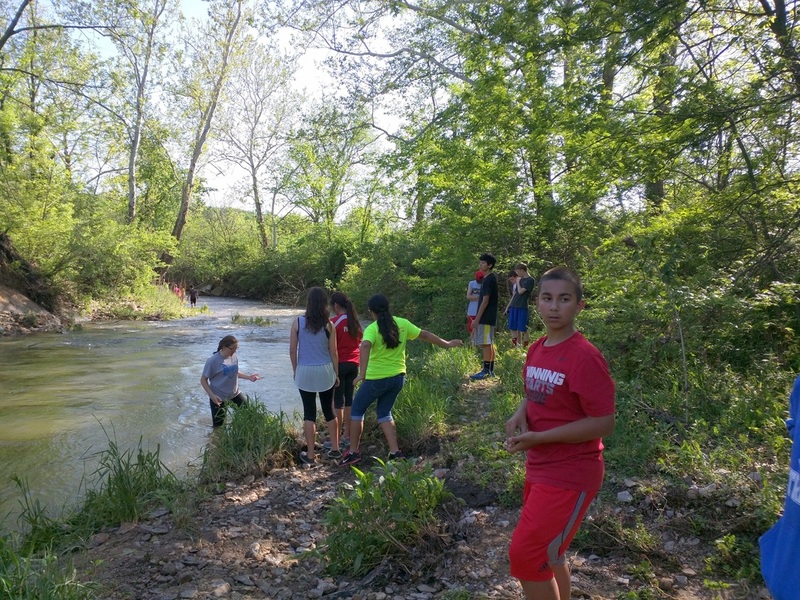 Picnic, hiking, outdoor fun that might include a pickup softball game or volleyball as well as a scavenger hunt! We will meet at St. Joseph Halle in Peru at 3pm and go by bus to a private park in Dalzell. Wear clothes to get wet or dirty in! 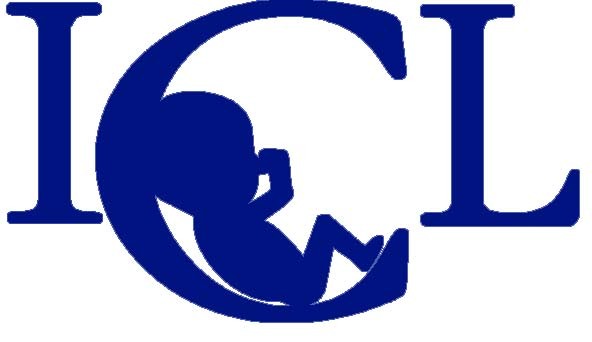 The Illinois Citizens for Life website has their regular newsletter published digitally. Log on to read about life-related news and events and how we can support and defend this greatest gift from God. Also included now is their voter's guide to help us see where various politicians stand on life issues. TCA Pork Chop Dinner Thursday! Walts Tap from 5 to 8pm. Dine in, carry out, or curbside. Menu includes 2.5 oz chops, homemade coleslaw, and mashed potatoes and gravy for $10.00. TCA OPEN HOUSE: Tuesday April 19th at 6pm! Check out the photo page of our website for the latest photos of parish events. Updates: St. Hyacinth Bazaar, Kermes 2015, and our Youth Group picnic. Please read the letter from our principal and bookkeeper about our new tuition system. FACTS management will help our families handle their tuition with flexibility and security while helping maintain stable fiances for our school. Bishop Jenky meets with our Emmaus Days participants at the diocesan retreat house in Henry and at St. Bede Abbey. Just as last year, the parishes in Lasalle had the strongest presence at these retreats which provide a fun atmosphere for prayer, learning, and fraternity. Participants are given the opportunity to interact with priests, seminarians and others their own age, both in serious spiritual matters and lighthearted activities. We are very proud of the nineteen young men who took time from their summer vacation to refocus on those things that are most important in life. Did you spot the new billboard? The Illinois Valley Latin Mass community set up a billboard inviting all to experience the Mass in the Extraordinary form of the Roman Rite. Mass is at 10am on Sundays at Holy Rosary. On third Sundays the Mass in sung. See the article in the News Tribune about our Latino Catholic community here in the Illinois Valley. In it Father Dittmer and Deacon Guerrero explain the joys and challenges experienced by our growing Hispanic population. Seven out of every ten baptisms in LaSalle are ministered in Spanish. And while many of these families are not able to remain in our area, a good number are - and are enriching our Catholic culture in LaSalle. Read the article in Tuesday's (the 18th) News Tribune or click here to access online. 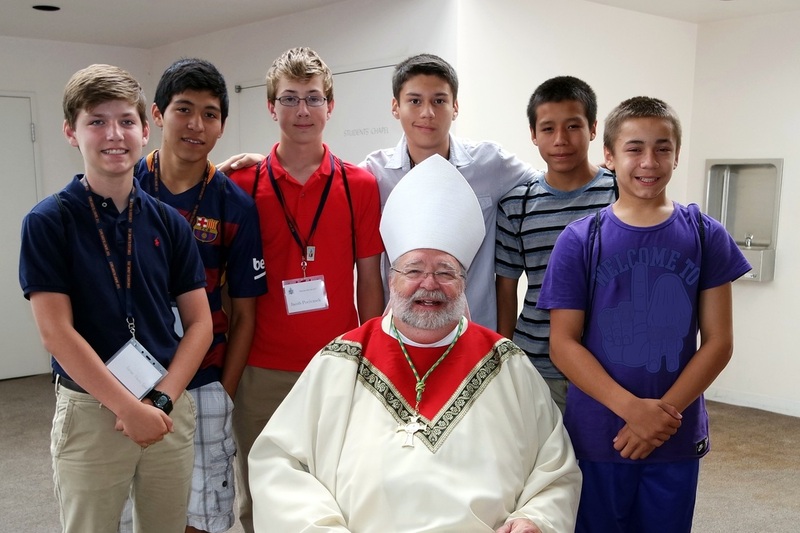 Visit our Schedules Page to download your serving schedule for all Mass Readers, EMCHs, and Altar Servers. 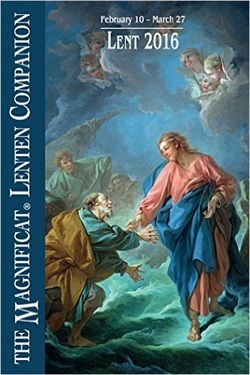 The Magnificat Lenten Companion, a booklet featuring original daily meditations on the Gospel reading for the forty days of Lent, is available for parishioners at the church doors. Lent is a time to refocus our hearts and revive our love of the Lord and one another. These booklets are a helpful spiritual resource, filled with inspiring reflections, faith-filled essays, prayers, poetry and devotions. A Special Thanks to the generous parishioner for supplying them for our parishes! 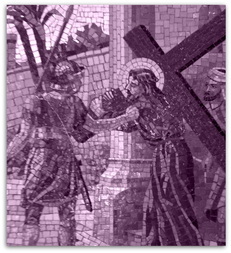 The Stations of the Cross will be offered at 5:30 pm at the Shrine on Friday evenings. 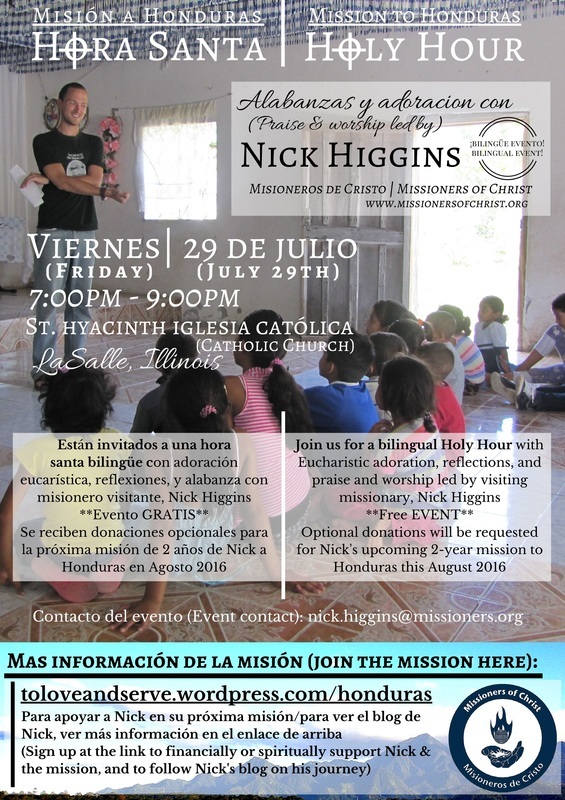 Stations also offered in Spanish at St. Hyacinth at 7:00 pm on Fridays. Trinity Catholic Academy will pray the stations on Tuesdays at 8:00 am at St. Patrick Church. All are welcome to attend. Living Stations with our TCA 8th grade will be on Holy Thursday at 9:30am. Alan Anderson, the Regional Director or Reigious Education, invites us all to participate at their Morning Reflection on the Divine Mercy at Holy Rosary Shrine. We are meeting Saturday March 5th from 9am to 11:30am. Fr. John Verrier of Brimfield will be our presenter. We will have adoration of the Blessed Sacrament. Refreshments will be provided. This is also an opportunity to pass through the Holy Doors of the shrine as designated by Bishop Jenky with an opportunity for a Plenary Indulgence. Please note: Mass in the Extraordinary Form is also available that morning at 8am.